WizKids has announced a new box set for Dice Masters, and it's a biggie. It's the Avengers Infinity Campaign Box and it's a starter set and much more. Containing a large selection of heroes, along with sidekicks, basic actions, and dice bags, it's the entire Infinity War in one box. The Dice Masters train keeps rolling along. The game is going to be getting a new set soon based on one of the popular Marvel Avengers characters. It's Thor, god of thunder (and rock and roooooooll!!). But he's hardly the only character coming in the set. Who else can you expect to see? Well, check out the new preview that WizKids posted and see for yourself. Seems we've got a couple Dungeons & Dragons releases today that aren't actually Dungeons & Dragons releases. In this case, it's the Tomb of Annihilation set for Dice Masters. Want to get your dice-rolling on without your full group there? Now you certainly can, as you take on undead horrors (or control them, if you so choose) with your fireball and sword. The next set for Dice Masters is available down at your LGS. It's the Superman and Wonder Woman starter set. This is the first starter set for the game that's not tied to a larger set release. As with usual starter sets, though, it's got enough dice for two players to get started right away building their teams, rolling their dice, and fighting it out. WizKids is coming out with a whole series of products based on the new storyline that Wizards of the Coast is running for Dungeons & Dragons, Tomb of Annihilation. This is more than just a set of minis to go with it. There's an entirely new board game as well as a Dice Masters set planned for the line. The Green Lanterns aren't the only color there is. Some of you might also know about the Yellow Lanterns. But even those are just two of the many, each one representing a different emotion or concept. 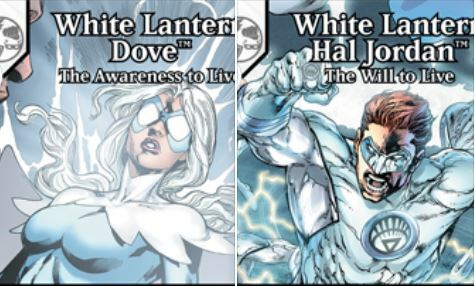 The White Lanterns represent life, and it's a couple of White Lantern cards for Dice Masters that we get a preview of here. You can pick these up in the new Batman set, available now. While Batman takes care of much of the crime problem in Gotham, he doesn't work alone. 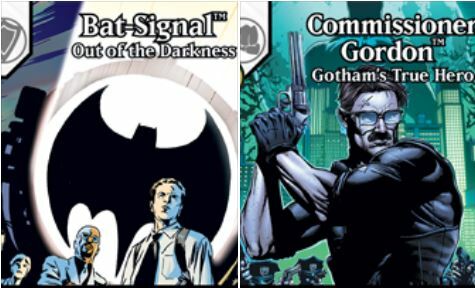 Commissioner Gordon certainly does all he can from within a system that seems tailor-made for corruption and ineptitude. He's getting a card and dice in the upcoming Dice Masters set, as is it Bat-Signal. A new DC-centered Dice Masters set is hitting soon from WizKids. Though the focus is on Batman, as always, there's plenty more heroes and villains to check out. 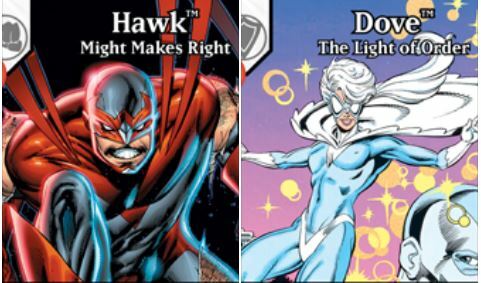 A pair of do-gooders with vastly different approaches, Hawk and Dove, are among the new heroes showing up. You can get a look at them here. WizKids has announced a new Dice Masters set. We've seen Marvel. We've seen Ninja Turtles. We've seen Dungeons & Dragons. This time around, they're headed to the world of DC Comics. Yes, Batman is getting his own Dice Masters set. Does whatever... umm... an iron can? Ok, so that might not work out so well as a song, but you can still increase the tech level of your Dice Masters games with the new Iron Man & War Machine set that's now available. Cowabunga, dudes! The new Heroes in a Half Shell set for Dice Masters is now available. The new starter has everything you need to get going, including over 90 dice, over 60 cards, and a paper play mat to help keep everything square. Grab some pizza and get to rolling. The Basic Action cards can really be the difference between winning and defeat in Dice Masters. You want to pick ones that help you, while hopefully not giving too much of a benefit to your opponent. Having Basic Actions that are tied to specific types of heroes can help, and that's just what you get with Fortification and Unibeam, two Basic Action cards coming in the Iron Man & War Machine set. HeroClix isn't the only set getting another Ninja Turtles set. WizKids also has a Dice Masters set coming down the pipeline. They've posted up a preview of some of the heroes you'll be getting, as well as some of the Basic Actions you can be expecting. A new set for Dice Masters is coming out soon. A much more technologically-advanced set, it focuses on Tony Stark and the various suits he has created for himself and others. Iron Man & War Machine gives you several versions of Iron Man's armor that haven't been seen before in the game. Take a look at a few of the cards here. While I wouldn't say that you have to play Black Sabbath when you get your Iron Man & War Machine starter set for Dice Masters next month, I'm not saying that you shouldn't do it, either. If you're interested in taking a look at what you can expect in the set, continue on. The characters in the Teenage Mutant Ninja Turtles world have gone through dozens of iterations since their initial comic release. Sometimes they've been a bit more dark and gritty. Other times they've been more lighthearted and kid-friendly. So just saying, "Ninja Turtles" can mean a lot of different things to a lot of different people. So, in order to give you a look at what you can expect in the upcoming Heroes in a Half Shell set for Dice Masters, WizKids has posted up this little preview. The Merc with the Mouth is making his way to your tabletops in the Marvel Dice Masters: Deadpool set, now available in North American stores (the rest of the world will get their soon). There's over 30 new heroes and villains (and their associated dice) that you can now add to your collection. Everyone's favorite Merc-with-a-mouth (well, except my friend CP. He hates Deadpool) is getting his own Dice Masters set. If you're a Deadpool fan (so... not CP), you'll want to check it out, as there'll be cards for Deadpool, Lady Deadpool, Dogpool, and Evil Deadpool. Continuing along with the super hero theme... and even with mystical super heroes... we've got the Dr. Strange Team Pack for Dice Masters from WizKids. You can run out to the shop and pick up a copy for yourself, if you're so inclined, since it's available now. One's the fastest man alive. The other... is... uh... really good at archery. Together, they're a new set for Dice Masters that's now available from WizKids. Though there's much more than just the two named heroes in the set. There's plenty of both heroes and villains to really beef up your collection.